Honey & co strikes again with a great veggie Sunday supper and fab left-overs for lunch-boxes on Monday. They suggest serving with yoghurt and green salad – we had some steamed rice too. Wine Suggestion: a conundrum in matching this with the slight bitterness from the walnuts, the earthy, smoky, velvety aubergine and the sweet-sour-crunchy pomegranates. In the end we went with the Chapelle en Rosé from Chateau St. Jacques d’Albas in Minervois which was red-fruited, sappy and minerally dry. If you can’t find this then open a dry rosé made in the style of Provence. Heat the oven to 220C/200C Fan/Gas Mark 7. Slice each aubergine into 5 or 6 slices lengthways. Keep the outside slices for the filling and the long inner slices for the rolls. Brush a couple of baking trays with oil and lay the inside aubergines slices flat on them. Drizzle with more oil and season with salt and black pepper. Roast for 20-25 minutes or until golden and soft, turn the trays around mid-way to make sure they cook evenly. Set aside to cool. Cut the aubergine trimmings into small dice (similar to the onion). 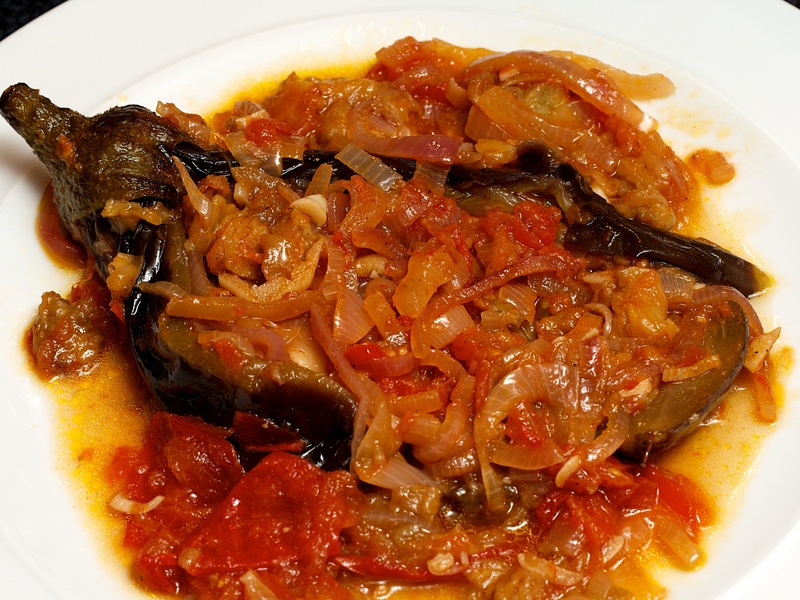 Fry the onion in the olive oil over a medium heat until starting to soften, then add the diced aubergine and salt. Cook until the aubergine goes very soft. Take the pan off the heat and add the rest of the ingredients. Mix well and season again if needed. Put a large spoon of filling at the end of each aubergine slice and roll into thick sausages. Put the filled rolls into an ovenproof serving dish. Spoon any leftover filling around the edges. Put into the oven for 5 minutes to warm through before serving. Sprinkle the rolls with the reserved walnuts and pomegranate seeds. Serve about 3 rolls per person with a dressed green salad, some yoghurt and steamed rice. Not quite a Baba Ghanoush, but you can drizzle on some tahini paste to make it one. This was really delicious and we loved the freshness from the lemons and the burst of fruity pomegranate. You need to start this many hours in advance but the process is very straightforward and the result is worth it. If using a gas hob, line the base with foil and keep only the burners exposed. Put the aubergines on 4 separate moderate flames and roast for about 15-18 minutes or until the skin is burnt and flaky and the flesh is soft. Use metal tongs to turn them now and then. Alternatively, score the aubergines with a knife in a few places, a couple of centimetres deep, and place on a baking tray under a hot grill for about an hour (we do ours on a gas barbecue). Turn them every 20 minutes or so and continue to cook even if they burst. Allow the aubergines to cool slightly, then cut along each one and scoop out the flesh and divide it into long strips with your hands. Throw away the skin. Drain the flesh in a colander for at least an hour or longer if possible to get rid of as much water as possible. Put the aubergine in a medium bowl and add the garlic, lemon zest and juice, olive oil, ½ a teaspoon of salt and a good grind of black pepper. 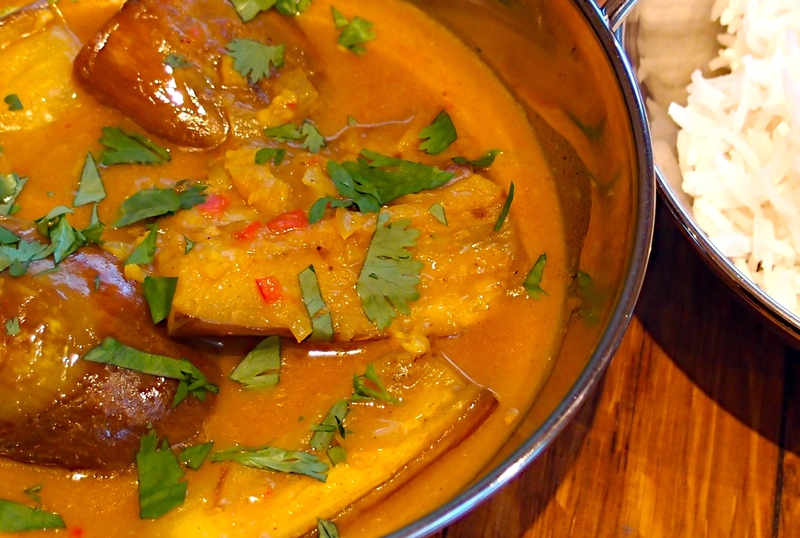 Stir and allow the aubergine to marinate at room temperature for at least an hour. When ready to serve, mix in most of the herbs and adjust the seasoning. 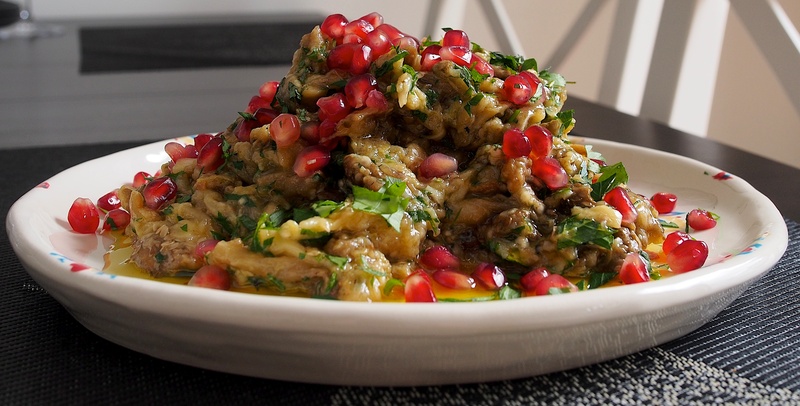 Pile onto a serving plate, scatter on the pomegranate seeds and garnish with the rest of the herbs. We served ours with some barbecued flatbreads. This is not the most attractive dish in the world and we definitely didn’t do the best job of cutting the aubergines. It nonetheless tasted delicious and we’re sure to do it again. Wine Suggestion: We’d recommend finding a juicy red from Spain. Look out for well made wines from the smaller and lesser known areas as these offer great value; this dish doesn’t need a refined and suave wine, some rusticity is good. We tried a juicy and smooth Tempranillo called Biberius from the Ribera del Duero and thoroughly enjoyed it! Leave the stem on the aubergines, score the skin and peel it away in thick stripes. Cut down the length of each one (without cutting completely in half) and scoop out the seedy bits. Chop these and set aside. Sprinkle the cavities with salt, and leave to drain on kitchen paper for half an hour, then wipe dry. Heat a good splash of oil in a frying pan. Add the aubergines and fry for about 7 minutes, until lightly browned and softened. Remove from the pan and leave to drain. Add some more oil to the pan and fry the onions, garlic and with the reserved seedy bits of the aubergine. After about 5 minutes, add the tomatoes, paprika, sugar and lemon juice, stir well and season. Put the aubergines into a deep frying pan with a lid. Stuff the cavities with the onion mixture and drizzle the rest over the top. Add the rest of the olive oil and 100ml cold water, then put on the heat. Bring to the boil, then turn the heat to low, cover and leave to cook for about 45 minutes or until completely tender. Serve warm or at room temperature with the mint sprinkled over the top and serve with crusty bread.